As I read Time magazine’s big cover story “The Silence Breakers,” Toni Morrison’s refrain from The Bluest Eye and other stories she’s told kept echoing in my mind’s ear: “As quiet as it’s kept.” The magnitude of the force fields that surround open secrets—in this case, rampant harassment and abuse—should amaze everyone and no one. The best black fiction finds a way to acknowledge our own open secrets, those ragged holes in the fabric of our collective psyche. For the longest time, I’ve kept an open secret. I went so far as to change my last name at 17 because I hated to admit who my father is. It was impossible to reconcile his contradictions, for one, but more devastatingly, attempts to step into my truth against various gradients of ignorance, ranging from disbelief to denial, exhausted me. On the other hand, people who know how my father really is strive to avoid the topic. I didn’t hear anyone beyond my family speak plainly about my father until I was in my 30s. “His thought process is not ... normal,” a novelist friend of his commented, unwittingly breaking the sound barrier. “Not that there’s anything wrong with that!” he quickly amended. My dad, so deeply sensitive that he recounts grievances against elementary school teachers as bitterly as if they happened yesterday, possesses only the most glancing conceptual awareness of empathy, affective or cognitive. He is an emotional Magic 8 Ball, though whereas the 8 Ball always responds, one randomly occurring facet of its icosahedron floating to the surface when prompted, often all my father has to offer, whether casually consulted or violently shaken, is impenetrable blue. Fame is a UFO, and people want to believe that it’s populated by alien life forms that bear scant resemblance to ordinary humankind. You might possess intimate awareness of disappointing facts about weather balloons, satellites or swamp gas, but if you’re not well-versed in alien lore, prepare to hear from “experts” that you’re sadly uninformed. The time has come to share my story, Gold Rush. It is not about me. It’s a coming-of-age story, a rags-to-riches story, a mystery, a drama. It is also the truth. When I began researching my reality-based dramatic series, Gold Rush, in 2007, I was strongly advised not to attempt to counter the narrative of my father, the misunderstood hero. “No one cares!” my mentor, the invigoratingly blunt actress Anna Maria Horsford, once shouted. No one wants to hear that Marvin Gaye’s uncle molested him; no one wants to know about Muhammad Ali’s “other” children or about Sammy Davis Jr.’s absentee parenting. Fair enough. I wish to entertain, not trouble the public with obscured and irrelevant details. Gold Rush tells the story of 20-year-old Kendrick Chandler, a rookie who has just been drafted as a point guard to the Los Angeles Gold Rush, the same team that made his father, Sharif, a legend a generation ago. The sports world eagerly anticipates a Chandler dynasty. Lost in all the hullabaloo is the fact that Kendrick, who grew up in a working-class Chicago neighborhood with his mother and sister, barely has a relationship with his distant, eccentric father. Kendrick races desperately to what he hopes is future glory while his older sister, LaTisha, doggedly investigates the violent and suspect death of one Penny Farrell, the wife of their father’s only close friend. LaTisha chases after secrets while Kendrick runs from them, but both siblings ultimately want to free themselves from the burden—shame, for Kendrick; silence, for LaTisha—that secrets always require their keepers to shoulder. By 2008 I had interviewed many Lakers players and staff for both background and voices. The one person I couldn’t interview was my own father. Since neither friends, family nor former business associates can account for what happened to my father, I must use a fantastical term to explain events: He became enthralled, in the fairy-tale sense of the word. He fell under the sway of a manager who whispers in his ear, controls his every move and poisons whatever she touches, including my father, against his family. He stared at me blankly when I compared her to Gríma Wormtongue from The Lord of the Rings, a set of books to which he himself introduced me, long before those stories were dramatized. Why not fiction? We live in a post-factual America, a country so hungry for truthiness that we import fake news from Macedonia. Everybody knows that our president, a reality-television character, was accused of sexually assaulting his wife and bragged about molesting women. Facts can fall upon deaf ears; they can be disputed, fade over time, even backfire. “The Silence Breakers” mentions all of these pitfalls even as it celebrates a startling paradigm shift. It’s important to remember that the groundswell began with women sharing their stories. Habiba Alcindor is an accomplished writer, screenplay author, producer, director and social justice advocate. She is a regular contributor to HuffPost, has written for The Nation, and is a board member of the Sports Fan Coalition and a volunteer with Paper Tiger. 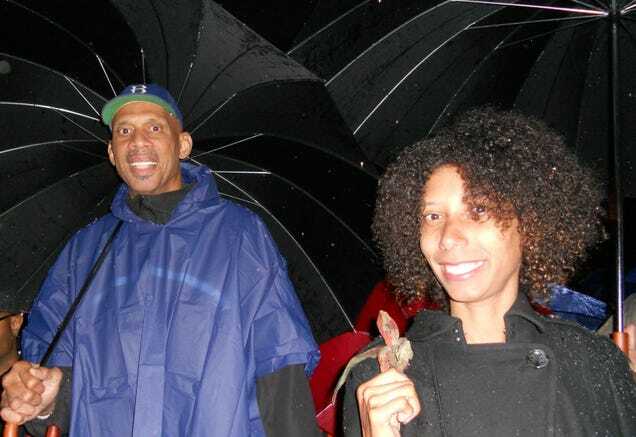 Alcindor is the daughter of NBA legend Kareem Abdul-Jabbar. Alcindor’s Gold Rush will be released in 2018. To connect or to see what she’s up to, visit her site.